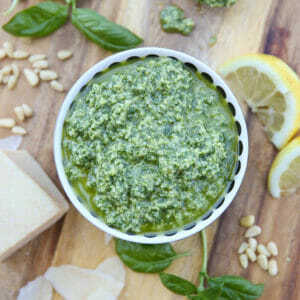 Easy recipe for fresh pesto. Great on pasta, pizza, chicken, sandwiches, and more! optional but suggested: squeeze of fresh lemon juice (couple teaspoons) plus a little of the grated zest. Place everything but olive oil in a food processor. (For the salt, start with 1/4 t and add the rest at the end. The final amount really depends on the saltiness of your cheese, so give it a taste first.) Give it a few pulses until things are chopped up. With processor running, slowing drizzle in oil until desired consistency is reached. Adjust any of the ingredients to taste, this is a great starting point! One of the great things about pesto is that it freezes well, so you can make it in the peak of summer when your basil is going bonkers and then have it all winter long. Just put it in an ice cube tray and after it’s frozen pop all of those cute little cubes in a zip-lock bag or freezer container. Pull them out any time you need a burst of fresh flavor. You can also put the whole batch of pesto in a freezer container, freezer bag, or foodsaver bag.